Talk about holding a grudge. 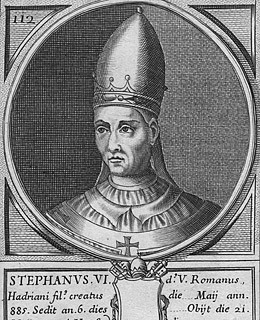 Pope Stephen VI (also sometimes known as Stephen VII) despised his predecessor, Pope Formosus, so much that even his death could not satisfy him  he wanted defamation. In the Cadaver Synod  what has been called "the strangest and most terrible trial in human history" and "one of the grisliest events in papal history"  Stephen VI had Formosus' rotting nine-month-old corpse dug up, redressed in his papal vestments and seated on the throne so he could be tried. Somehow the corpse hadn't built much of a defense, and Formosus was found guilty of what were likely bogus charges. As punishment, three of Formosus' fingers were cut off (the three fingers on the right hand used to give blessings). The corpse was then stripped of his sacred vestments, dressed as a layman, dragged through the streets and dumped in the Tiber River  where he was finally able to rest in peace. See pictures of President Obama meeting Pope Benedict XVI.